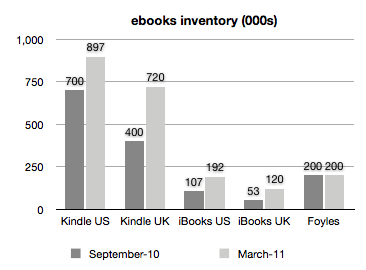 This chart shows data from the AAP on US ebooks sales by value. I’ve indexed it to 100 because the dollar values are somewhat problematic, but the relative trend is very clear. 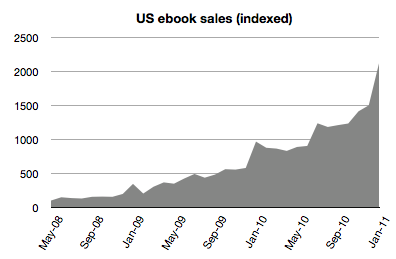 On these numbers, US ebook sales hit 10% of the total market in January 2011. This is borne out by plenty of anecdote from the industry as well. The pattern from each of the two previous years is of a huge jump in January setting the level for the year. Presumably this is driven by Christmas sales of ebook readers and hence a larger addressable market. However, it is interesting that sales don’t seem to grow nearly as much in the course of the year. A quick look at current ebooks inventory shows where most of that volume is likely to be coming from (B&N missing because, well, it’s Friday afternoon). Apple really needs to step up a level - it has fewer ebooks in stock than Foyles has physical books in its landmark London shop. The other interesting stat I dug out (which I can’t share in detail, unfortunately) has to do with the distribution of book buyers. In the UK, of 27m adults, 22m buy 10 books a year or less, and this is 51% of the value of the market. In other words, half the market revenue comes from people who are almost certainly not going to spend £100 on an ebook reader. There’s an interesting symmetry in this with another stat, from Nielsen: US physical album sales have halved in volume in the last 10 years. This is a classic ‘glass half empty/glass half full’ sort of number, but it intrigues me because after 10 years of Napster, iTunes, iPods and piracy, with a content type ideally suited to migration to digital, HALF THE OLD MARKET HAS SURVIVED. Anyone who thinks books will go digital faster than music is on drugs. In other words, we’re clearly on an S-Curve of sorts. But it is by no means certain that the S-Curve will flatten out at 90% - it might slow down at well under 50%.